VAPAE aims to be at the center and forefront of the statewide and national debate regarding the place and importance of the arts for all and to be a catalyst for positive change in urban arts education. During the 2018-2019 year VAPAE is offering an exciting public event series that explores a variety of topics and strategies to promote arts equity and high quality arts education initiatives. These events will bring together community members as well as local, state, and national leaders to further these conversations. All events are free and open to the public – Reservations suggested. For more information contact: 310.794.4822 or VAPAE@arts.ucla.edu. 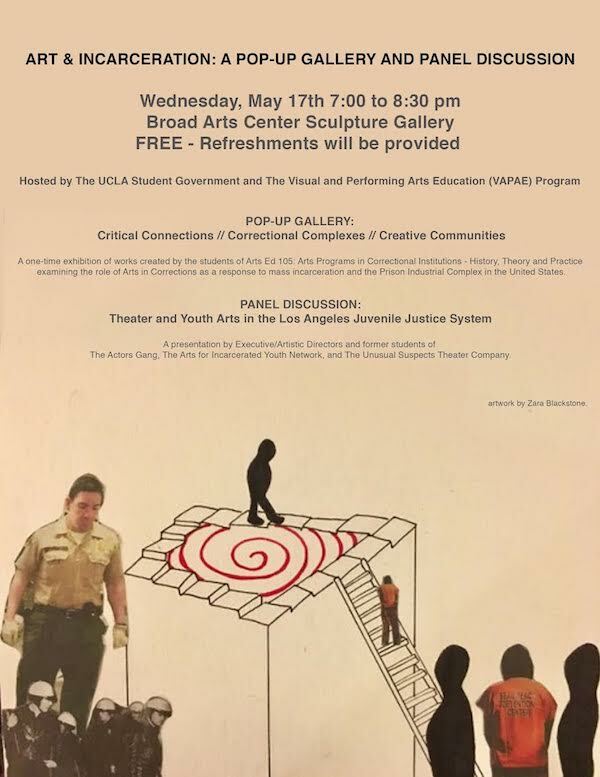 The UCLA Visual and Performing Arts Education (VAPAE) Program hosts this free public event to discuss art, education and social change in schools and communities. The monarch butterfly is a symbol Favianna Rodriguez has used throughout much of her activism and art work, serving as a representation of crossing of borders and the beauty of migration. Illuminating Favianna’s personal and artistic mission, which is to inspire social and political change through art, cultural organizing, and technology, her presentation will offer new ideas pertaining to how we speak about, write about, and create around issues of migration and social engagement. The community arts gallery display set up before the event, and the panel discussion and audience Q&A following Favianna's keynote will both further expand upon, explore, and represent these key topics. VAPAE presents this event in collaboration with the UCLA Department of World Arts and Cultures/Dance, UCLA Graduate School of Education & Information Studies, UCLA Art & Global Health Center, UCLA Center for Community Schooling, and the Fowler Museum at UCLA. This event is sponsored by the UCLA Office of Interdisciplinary & Cross Campus Affairs. Reception at 6pm. Lecture and panel discussion at 7pm. Parking is available at UCLA Parking Structure 4, located at 221 Westwood Plaza, Los Angeles, CA 90095. December 12th, 2018 will be the 2nd annual Arts Through Community: A Celebration of VAPAE’s Afterschool Art Programs where all of VAPAE’s afterschool arts programs, teaching artists, and staff will display their works at the UCLA Sculpture Gallery. Please join us for food, artworks, and celebration of community! On October 13th, 14th, & 15th, 2017, the Justice Work Group at UCLA will host Beyond the Bars LA: The End of Mass Incarceration, our inaugural conference, to bring together the community organizations, activists, policy makers, researchers, students, and those directly impacted by issues of incarceration from across the nation. This conference seeks to join the efforts of individuals and groups in these different sectors all working to end mass incarceration, to bring together our knowledge, experience, and expertise. Our goal is not only for us to educate and engage one another, but to form lasting working relationships and inspire each other into action and create genuine social change. This year's conference theme is The End of Mass Incarceration, which will focus on conversation and organization that orients us toward a future without mass incarceration, and righting the social wrongs it has produced. Broad Art Center Sculpture Gallery. FREE. Refreshments provided. A one-time exhibition of works created by the students of Arts Ed 105: Arts Programs in Correctional Institutions - History, Theory, and Practice examining the role of Arts in Corrections as a response to mass incarceration and the Prison Industrial Complex in the United States. A presentation by Executive/Artistic Directors and former students of The Actors Gang, The Arts for Incarcerated Youth Network, and The Unusual Suspects Theater Company. Co-Sponsored by the Visual and Performing Arts Education (VAPAE) Program in the School of the Arts and Architecture and the Department of Theater in the School of Theater, Film & Television. Through this free public event, the UCLA Visual and Performing Arts Education (VAPAE) Program, in collaboration with the Department of Theater in the School of Theater, Film & Television, seeks to bring together multiple publics to discuss the importance and impact of the teaching artist profession and the conditions necessary for excellent teaching artists to blossom and thrive in partnerships with non-profit arts organizations and local schools. Often referred to as the “father of the teaching artist profession,” keynote speaker Eric Booth has been writing and speaking about the teaching artist profession for the past 30 years. His writings and videos share his methodologies and philosophies on working as a teaching artist across disciplines and in various settings, as well as have guided and helped articulate “best practices” in the teaching artistry field. In recognition of his inspiring guidance to countless teaching artists who have entered the profession, Eric was given the nation’s highest honor in arts education – the Arts Education Leadership Award, from Americans for the Arts, the first teaching artist ever to be so honored. At this event, Eric will reflect on his teaching methods that have proved most effective with multiple groups and share his ideas about what excellence means in teaching artistry. At the same time, this evening's conversation will reflect on the challenges and responsibilities of all teaching artists that are working in the field at this important moment in history – a time when many in our community, most especially our children and families, are feeling frightened and anxious. In addition, a panel of local practicing teaching artists, including Melanie Rios Glaser, Vijay Gupta, and Leslie Ishii, will reflect on what it means to be an excellent teaching artist in our Los Angeles communities during the days of Trump and his administration. Join us for a gallery opening to celebrate the photographs from our students at Venice High! The UCLA Visual and Performing Arts Education (VAPAE) Program, in collaboration with the Graduate School of Education and Information Studies, the Department of World Arts and Cultures/Dance, and Luskin School of Public Affairs, seeks to bring together multiple publics to continue important discussions about the ever-growing need for access to high quality arts education for all students, specifically youth in the local Los Angeles community. The evening is designed as an extension to the conversations that began with VAPAE’s Public Event “What Is High Quality Arts Education and Why Does It Matter?” led by Harvard University’s Steven Seidel in November of 2015. Pullens and the panelists will discuss relevant topics in arts education with a decidedly local perspective, including updates on the Los Angeles Unified School District’s (LAUSD) commitment to rebuild its arts education budgets and meet the mandate to position the arts as core curriculum at all LAUSD schools. In addition, the panelists will reflect on the current state of the teaching artist profession and arts credentialing programs, and the ramifications of the newly passed Theatre and Dance Act SB 916. As the event takes place so soon after our presidential and senate elections, the conversation will describe the political intersections and overlapping concerns of the fields of arts education, community arts, and community engagement. By asking how local and statewide arts programs and initiatives are addressing the needs of their communities and sharing how arts leaders at various sites are evolving their programs in order to address key issues of access and quality, VAPAE will continue its advocacy work towards identifying “best practices” in the arts education field. Cost: FREE tuition. In addition, participating teachers from schools located within a 15-mile radius of the Hammer Museum are eligible to receive subsidized bus transportation for one field trip to the museum or Franklin D. Murphy Sculpture Garden during the 2016-2017 school year. Connecting Art and the Common Core: A Teacher Institute is organized by the Hammer Museum and the Visual and Performing Arts Education Program (VAPAE) in the UCLA School of the Arts and Architecture. Learn how to enhance students' speaking, listening, and evidence-based reasoning skills through inquiry-based discussions about works of art. Explore strategies for making authentic and socially relevant connections to art through observation, kinesthetic practice, and reflection. Develop lessons that integrate the arts and humanities and align with Common Core standards. Enhance confidence in leading students on a trip to an art museum with a subsidized bus. This institute is designed for generalist and language arts teachers. Since capacity is limited, priority will be given to generalist and language arts teachers. Please RSVP with your name, school, and subject(s) and grade level(s) you teach to academicprograms@hammer.ucla.edu. The first and third day of this three-day institute will take place at the Hammer Museum. The second day will take place at the Broad Art Center and Franklin D. Murphy Sculpture Garden on the UCLA campus. The Hammer Museum is located at 10899 Wilshire Blvd., Los Angeles, CA 90024. The Broad Art Center is located in 240 Charles E. Yound Drive, Suite 2101, Los Angeles, CA 90095. Tuesday, May 3, 2016 at 7 p.m. Nationally known art educator George Szekely will draw from his two classic volumes, Encouraging Creativity in Art Lessons and From Play to Art and his new book, Play and Creativity in Art Teaching, to discuss his approach to teaching art. The central premise is that art teachers are not only a source of knowledge about art but also a catalyst for creating conditions that encourage students to use their own ideas for making art. Teachers can build on children’s energy and self-initiated discoveries to inspire school art that comes from the child’s imagination. The foundation for this teaching approach is the belief that the essential goal of art teaching is to inspire children to behave like artists and that art comes from within themselves and not from teaching formula or a single set of techniques to be followed – rather he discusses and models how all teachers can help children find art in familiar materials and ordinary places, accessible to everyone. George Szekely is Professor and Director of Graduate Studies in Art Education, University of Kentucky and President-Elect of the National Art Education Association. For his lifetime contributions to art education, he received the Victor Lowenfeld Prize and the Emanuel Barkan Award. He was named a National Treasure by the National Art Education Association and presented with the honor of becoming a Distinguished Fellow. After a brief introduction to the Bauhaus-inspired pedagogy of the remarkable artist Friedl Dicker-Brandeis, Dr. Wix remembers this devoted teacher through the words of eleven survivors who studied art with her in the Terezín concentration camp in 1943 and 1944. The words of the survivors and the images made when they were children comprise the excerpts that tell the stories of the students’ memories of their experiences with this exceptional art teacher in Terezin. Based on recent interviews the excerpts are grounded in Dr. Wix’s research into memory as sited; the portraiture encounter; and the life lessons that the young art students took from their teacher, Friedl Dicker-Brandeis. The evening includes a short musical component featuring the Milken Community School Kol Echad Concert Choir and UCLA student, Danielle Kathleen Bayne, co-sponsored by the Mickey Katz Endowed Chair in Jewish Music at UCLA. Dr. Linney Wix, Ph.D., is a Professor of Art Education in the Educational Specialties Department at the University of New Mexico. In 2000, she began investigating the art and pedagogy of Friedl Dicker-Brandeis who adapted the Bauhaus Basic Course to teach creative art classes in the Terezín concentration camp from 1942- 44. In 2011, Dr. Wix guest-curated the exhibition Through a Narrow Window: Friedl Dicker-Brandeis and Her Terezín Students at the University of New Mexico Art Museum and authored a book by the same title (UNM Press, 2010). In 2013, as a Fulbright Scholar in Prague, Dr. Wix continued her research focusing on art and memory in the context of the art classes in Terezín, through interviews with the surviving child artists. Co-sponsored by the Dortort Center for Creativity in the Arts at UCLA Hillel, UCLA Alan D. Leve Center for Jewish Studies, Los Angeles Museum of the Holocaust, Department of Marital and Family Therapy at Loyola Marymount University, UCLA Graduate School of Education & Information Studies, UCLA Luskin School of Public Affairs, the Herb Alpert School of Music at UCLA and the Visual and Performing Arts Education Program (VAPAE) in the UCLA School of the Arts and Architecture. Questions of Quality: What Is High Quality Arts Education and Why Does It Matter? Tuesday, Nov. 17, 2015 at 7 p.m. Followed by Panel Discussion including Annamarie Francois (Executive Director, UCLA Center X); Steve Zimmer (Board President, LAUSD); Malissa Feruzzi-Shriver (Executive Director, Turnaround Arts CA); Carolyn McKnight (Principal, East LA Performing Arts Magnet Academy); and Talia Gibas (Professional Development Program Manager, Los Angeles County Arts Commission). How do arts educators conceptualize quality in arts learning experiences and how do they work to achieve and sustain quality in their work? And what role do young people play in creating high quality arts learning experiences? Dr. Steve Seidel, Bauman and Bryant Chair in Arts in Education at the Harvard Graduate School of Education, will share his research on the challenges of offering high quality arts experiences to all students. Exploring key questions, concerns, and provocations from the seminal 2009 report, The Qualities of Quality, that he produced with colleagues from Harvard Project Zero, Seidel will discuss why these issues still matter to our youth, our schools, and our communities. Seidel's presentation will be followed by a panel discussion, moderated by Talia Gibas. The panelists, all highly respected thought leaders from the fields of arts education, arts advocacy, and social justice pedagogy, will share their insights regarding the concept of quality in the arts, and the strategies they are committed to in order to ensure that all students have access to similar experiences and opportunities. Steve Seidel holds the Patricia Bauman and John Landrum Bryant Chair in Arts in Education at the Harvard Graduate School of Education. He is Faculty Director of the Arts in Education program and a former director of Project Zero (2000-2008). At Project Zero, Seidel was Principal Investigator for projects that have studied the use of reflective practices in schools, the close examination of student work, and the documentation of individual and group learning. His current research includes Talking with Artists who Teach, a study of working artists’ ideas and insights into the nature of artistic development and learning, and the Illuminating Standards Project, an exploration of what standards actually look like in student work. In 2009, Seidel and colleagues at Project Zero completed The Qualities of Quality: Understanding Excellence in Arts Education, a study of what constitutes quality in arts learning and teaching. Before becoming a researcher, Seidel taught high-school theater and language arts in the Boston area for 17 years. He has also worked as a professional actor and stage director. Co-sponsored by the UCLA Graduate School of Education & Information Studies, UCLA Luskin School of Public Affairs, Department of Design Media Arts and the Visual and Performing Arts Education Program (VAPAE) in the UCLA School of the Arts and Architecture. Thursday, Jan. 21, 2016 from 6 p.m.-10 p.m.